Try Our Transaction Management Today! Sign up today and let us help you save time and money! We will complete your next two real estate transactions for the price of one! I have used transaction coordinators for most of my real estate career. The quality and experience of the REBO process is unmatched. I highly recommend REBO for all of your real estate transactions. As real estate agents, we know that you are essentially running your own business. You don’t have time to do everything and grow your business. We also know that obtaining and completing all necessary and required files takes up the bulk of your time - much of which is spent after hours. Our promise to you is that you can take back your time - especially your evenings and weekends. We act as your personal assistant and will prepare your files for full review with the utmost care and attention. What you do with your sudden increase in free time is your business, but giving time back to you is ours. 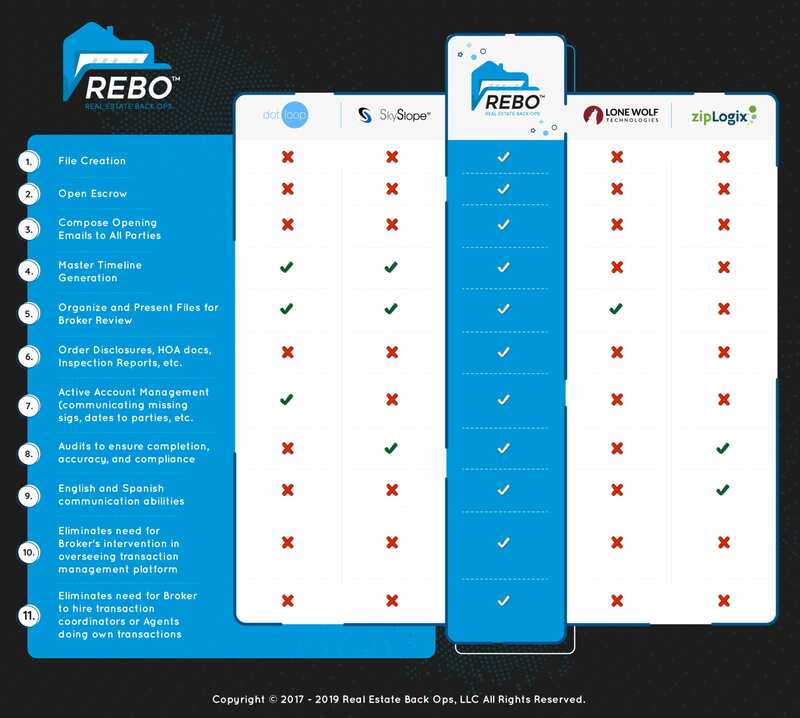 REBO is not a Software that still requires Real Estate Agents to complete the paperwork for each transaction. We are real estate transaction experts. We have simplified every phase of the transaction process to make your life easier. REBO delivers white-glove concierge service at an affordable price per transaction. REBO works for everyone. From a single agent to the largest brokerage, we save you hours of work and reduce overhead costs. Focus your time and energy on what you do best – taking great care of your clients. We can start working on your transactions right away! We will jump on a call anytime you are ready to get started - are you ready? We understand your needs and goals for your company. You run a high performing brokerage and need to decrease your total overhead while being more efficient. You also know that you need to offer better service for your agents so that they can compete with other new technologies. Or you are an agent and have hit a plateau in your business but know that if you had more time in your day then you would close more homes. You focus on all of that because we are the best in the industry of transaction management. We have broken down each step of the transaction process and perfected it. Why such a great offer on your first two transactions for every new agent? Because we know that our services are so much better than any other solution available that once you have a taste you will realize just what you have been missing! You'll rest easy knowing that each transaction is completed with improved efficiencies to your current processes. Your clients will have a much better overall experience with our smooth and clean transaction process that you will get more referrals and have the time to take on the increase in business. No one else in the industry is as good at transaction management as we are. We are giving you two transactions for free because we are so confident that you will love our services. Find out today how REBO can save you 10-12 hours per transaction while giving your clients the best home buying experience available.